I have tasted Kulfi Ice cream when I was a kid. When I go to marina beach with my parent and uncle, they used to buy and give it to me. I love the taste. But I am not able to get it near my home place. I get only normal kuchi ice or ball ice. After that I really forgot how it actually tastes, as I started tasting different ice creams. Then after I started preparing ice creams at home, I always think I should prepare kulfi atleast once. But somehow i keep postponing it, because I don’t have the kulfi cones and sometimes, I will not have the exact ingredients etc. Two weeks back, I got the ready made khoya from Mustafa centre and prepared this Mango Kalakhand. Half the packet of khoya was left over and I wanted to do something which i never tried before. 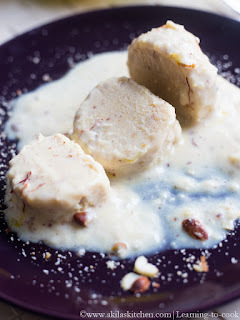 So when browsing net, I saw the Kulfi Ice cream using Khoya recipe here and thought of using my khoya and also fulfil my long wish of preparing the kulfi ice cream at home. Kulfi came out superb and we all loved it a lot. My kids asked me to prepare the same one more time. I too have decided to prepare different kulfi’s in coming posts. You can check all my Ice cream Recipes here. Some have given below. 1. Start boiling the milk in a flat bottomed vessel. Now and then stir it well. It might take around 20 to 30 minutes for the milk to reduce to 1/3rd. 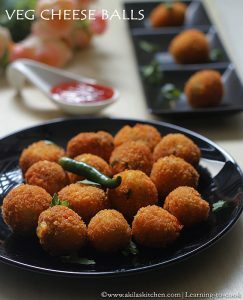 Meanwhile start preparing the other things needed Mix the 4 tbsp milk with corn flour and keep it ready in a small bowl. 2. Crush all the almonds, pistachios and cashews in a mortar or grind in a food processor. If you have whole cardamoms, then grind 2 to 3 of them now and keep everything ready. 3. Grate the khoya or crumble it very well. There should not be any large pieces of khoya. If so, then might take time to dissolve. After 20 to 30 minutes, the milk would have reduced to 1/3rd of its quantity. 4. Now add the sugar and mix it well. When the milk is still boiling add the corn flour mixture to the boiling milk. Stir them well. The milk gets thickened by now. 5. Now add in the almond, pistachio and cashew powder and cardamom powder as well. Mix well. Add the saffron strands. 6. Milk would have thickened nicely by now and colour would have started changing. 7. It’s time to add the khoya. Add the khoya and mix nicely so that no lumps are found. After 5 minutes Simmer the stove now and add the rose water. Switch off the stove and let it cool down. 8. 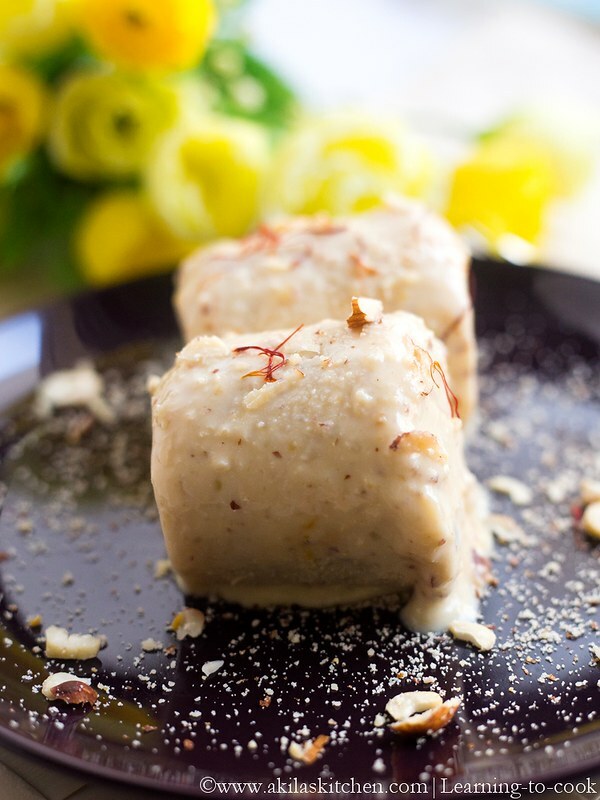 After it cools down, transfer the kulfi mixture to kulfi cones or kulfi moulds or any small serving bowls or in a tray. Scrap the remaining milk solids from the sides of the vessel and add them too in the moulds. Cover and freeze the kulfi for 6 to 8 hours. 9. 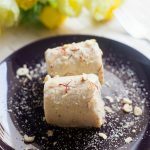 Once the Kulfi is set nicely, remove it from the freezer and unmould the kulfi by sliding a knife along the sides of the kulfi mould or rub the mould between your hands fastly or even keep the mould immersed in warm water for 5 seconds and remove immediately. 10. 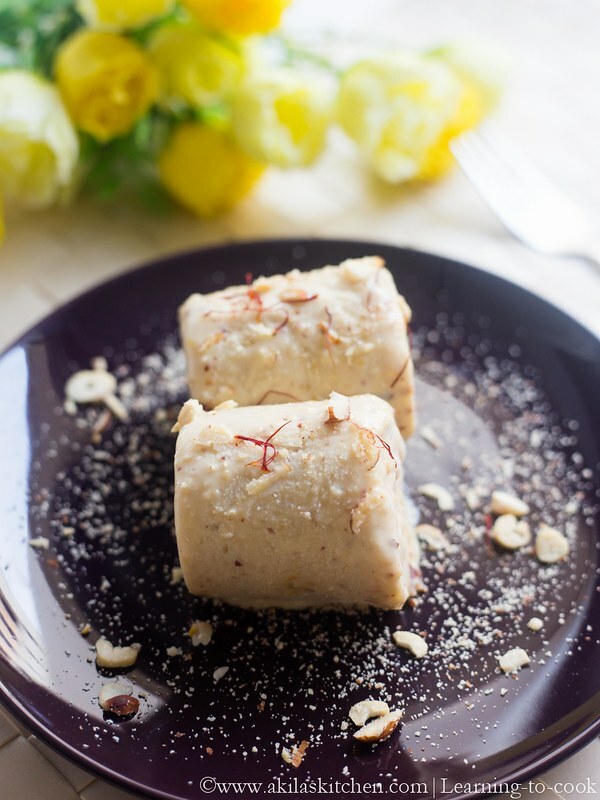 Slide down the kulfi on the serving plates and serve immediately. 1. Instead of corn flour, you can also use rice flour to make the milk thicker. 2. If you are keeping the kulfi mould in warm water, do not keep it for long time. 3. Any nuts of your wish can be added to the kulfi. 4. Adding rose water or essence is purely optional. 5. Traditional kulfi moulds would be available in many shops. You can also use earthen pots for making kulfi. Start boiling the milk in a flat bottomed vessel. Now and then stir it well. It might take around 20 to 30 minutes for the milk to reduce to 1/3rd. Meanwhile start preparing the other things needed Mix the 4 tbsp milk with corn flour and keep it ready in a small bowl. Crush all the almonds, pistachios and cashews in a mortar or grind in a food processor. If you have whole cardamoms, then grind 2 to 3 of them now and keep everything ready. Grate the khoya or crumble it very well. There should not be any large pieces of khoya. If so, then might take time to dissolve. After 20 to 30 minutes, the milk would have reduced to 1/3rd of its quantity. Now add the sugar and mix it well. When the milk is still boiling add the corn flour mixture to the boiling milk. Stir them well. The milk gets thickened by now. Now add in the almond, pistachio and cashew powder and cardamom powder as well. Mix well. Add the saffron strands. Milk would have thickened nicely by now and colour would have started changing. It's time to add the khoya. Add the khoya and mix nicely so that no lumps are found. After 5 minutes Simmer the stove now and add the rose water. Switch off the stove and let it cool down. After it cools down, transfer the kulfi mixture to kulfi cones or kulfi moulds or any small serving bowls or in a tray. Scrap the remaining milk solids from the sides of the vessel and add them too in the moulds. Cover and freeze the kulfi for 6 to 8 hours. Once the Kulfi is set nicely, remove it from the freezer and unmould the kulfi by sliding a knife along the sides of the kulfi mould or rub the mould between your hands fastly or even keep the mould immersed in warm water for 5 seconds and remove immediately. 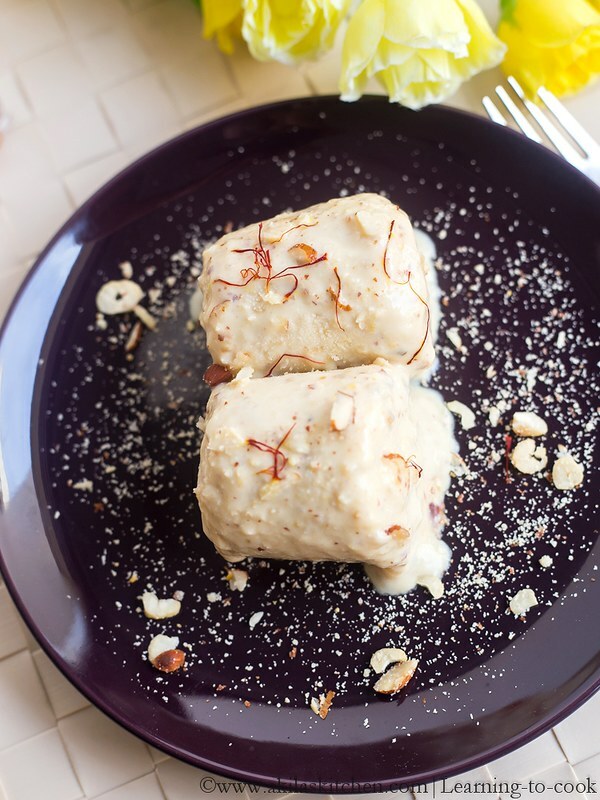 Slide down the kulfi on the serving plates and serve immediately. That's an extra rich kulfi!